The Burnley News, Wednesday, February 21, 1917. SUCCOMBS TO WOUNDS ON WAY TO HOSPITAL. 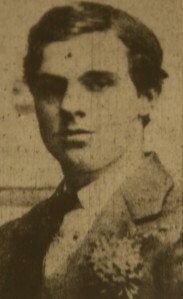 Peculiarly sad circumstances surround the death of Private Harry Thompson, 8th East Lancashire Regiment, of 37, Towneley-street, Briercliffe, who has succumbed to wounds received in action. The deceased soldier was being conveyed to hospital when he died. He leaves a young widow and a baby only three weeks old. Private Thompson enlisted in August last, and after undergoing a period of training at Plymouth he went out to France about three months ago. Mrs. Thompson, of 37, townley-street, Harle Syke, and formerly of Padiham, received an official notification from the Record Office at Preston, on Monday, to the effect that her husband, Pte. Harry Thompson, 28756, of the East Lancashire Regiment, was killed in action on February 17th.. The deceased soldier was very well known in Padiham owing to his connection with his father, who is a coal merchant, and who resides at 834, Padiham-road, Cheapside. Pte Thompson was formerly a Sunday School scholar at the Cross Bank Wesleyan School, Padiham, and is also on the roll of honour there. At the outbreak of the war he first enlisted with the R.A.M.C., and served six months with them at Netley. Completing his term, he returned to his father's business until August of last year when he joined up. He went from Burnley to Preston, and then to Plymouth, eventually arriving at the front ? months ago. The unfortunate young soldier was only 34 years of age. Pte. Thompson was married ? fourteen months ago to a Miss Ivy ? of Townley-street, Harle Syke, the ? of her mother, and the young widow is ? with a baby three weeks old.